Comment: For all of you rarities collectors out there, this one's for you. This is a fine and unusual gemstone consisting of two separate minerals. Ordinarily this would only be a simple purple Amethyst and colorless Quartz gem were it not for the tiny red, fibrous inclusions of Lepidocrocite inside of it! Lepidocrocite is iron oxide that forms in slender, acicular or "needle-like", bright red crystals (typically as inclusions inside of Quartz). This material is sometimes referred to as "strawberry quartz". 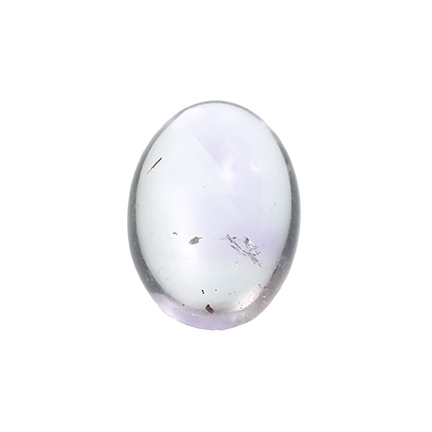 This "Oval Cabochon" cut stone is a nice representative example of this material. If you're in the market for something unique and different, check out this stone. Enjoy.